The inaugural group appears to have a diverse focus, with projects stretching across all different verticals from gaming to medicine. However, there seems to be a strong focus on educational or medical/therapeutic uses for VR, as five out of the thirteen companies appear to fall into this category. Rothenberg says, “those are companies that are affecting people’s lives immediately” which is why there was such a concentration in that industry. Each of the companies accepted into the program will receive $100,000 in cash, as well as access to a “clubhouse” co-working space and mentorship. Accelerators have been a part of the startup ecosystem for a while and have helped countless companies achieve big success, but River is the first ever focused solely on VR, which leads to one of the great potential benefits of the program, collaboration. All these companies will be working together in a shared space, meaning plenty of opportunity for collaboration and idea sharing. With this many great minds working together, there are sure to be a couple more interesting projects that arise from this workspace. Wilson, a gamer himself, started working on eye tracking after trying to play Team Fortress 2 on the DK1, and getting frustrated at not being able to win. “I was getting killed by bots,” says Wilson, “and I was like ‘this shouldn’t be happening.’” By adding eye tracking, Wilson is able to overcome the parallax effect that makes aiming in FPS’s in VR so hard. But it’s not just gaming, eye tracking has the power to enable things like depth of field, and deeper interaction with AI. It is also enabling people with muscular dystrophy to play the piano, which is pretty incredible. Bringing with him two of the most well known VR experiences to date, the Proto Award nominated SightLine the Chair, and the incredible education experience, World of Comenius. SDK is a bootstrapped startup coming out of South Africa, which is an accomplishment in and of itself as Mike Rothenberg told me, “if you want to talk about overcoming crazy obstacles? Try bootstrapping a virtual reality company in Africa.” SDK is producing augmented and virtual reality industrial training experiences. They have already worked with an impressive client list including Nokia, Timberland, Samsung, Microsoft, and Qualcomm. Beyond developing training experiences in AR and VR, the team is also working on eyeball and facial tracking, as well as facial recognition. The team recently won a “Technology Top 100” award for their efforts thus far. Currently the team has created two VR educational experiences, Rome Reborn and Vessels VR. Rome Reborn offers users a virtual tour of ancient rome, as it might have appeared in 320 A.D. The experience eventually intends to show the progression through time of the city from 3000 B.C. until the early middle ages in 550 A.D. Vessels VR is a VR educational experience that takes people on a “magic school bus” ride through human organ systems at a cellular level. The journey is also guided and narrated by a friendly robot named PAL (Personal Assistant for Learning). Psious is a virtual reality platform for mental health practitioners that is working on VR experiences that help to cure patients’ fears using immersion therapy. Their platform runs on mobile VR, meaning that it is highly accessible to doctors world wide, meaning that it is positioned for rapid adoption. The system comes with a number of predesigned scenarios meant to help treat common disorders, including: fear of public speaking, fear of flying, arachnophobia, fear of needles, fear of driving, agoraphobia, and of course the classic fear of heights. The experiences are customizable to fit the needs of the individual patients, allowing therapists to gradually increase the virtual exposure, to help clients take their therapy one step at a time. The system also comes with software that allows for therapists to track their patients progress through the program. DeepStream VR is a company that creates intelligent adaptive games that assist with pain relief. Their system allows for VR using a laptop without googles or glasses with can be restrictive and uncomfortable for certain patients, like burn victims for example. Reload studios is an independent game studio that is comprised of 15 members, including former Call of Duty developers and Disney artists. At the Samsung developers conference Chetan Bedi, one of the teams designers, said that his team embraced the Infinity Ward mantra of ‘framerate and fun.’ Meaning that they wish to make sure the experiences they create are heavily optimized. Their game is expected to be released some time this year. Innerspace VR is a company that is focused on creating high quality VR content that has an emphasis on artistic and cultural expression. The team has already achieved an impressive list of partners, including Oculus, Samsung and Crytek. Currently Innerspace has 3 projects that they have created, The Fifth Sleep, PLAYHEAD, and The Cave. The Fifth Sleep – Trailer from Balthazar Auxietre on Vimeo. The Fifth Sleep is an experience that is “at the crossroads of video game and cinema,” that challenges players to make the choice between waking a patient who is trapped in a coma by entering his body, blood and brain, or leave him to his dreams, where he attempts to convince you that he belongs. The Fifth Sleep is coming as a free download for the Samsung Gear VR. PLAYHEAD is a interactive musical game that combines music and world creation in a new way that allows users to craft their songs down to the individual note, then remix those pieces which are associated with visuals. By editing the song, you edit the environment. The game immerses users in the music in ways never before possible. On ne sait jamais de quoi le passé sera fait from Balthazar Auxietre on Vimeo. In this experience, players travel though a landscape in the glacial age. Walking through the scenery players discover and explore a cave with which they are able to interact to explore its secrets. The idea of this experiences is that prehistoric cave paintings were the first example of immersive storytelling, so this was an homage to that. Thotwise is an indie game studio that is focusing on exploration and suspense games. Their current project entitled, The Hum: Abductions is a first person horror game that is being developed with Unreal Engine 4. In the game you will play the role of Holly Sanders who is living out the days since her husband’s disappearance months ago. You will face a quest that leads you to uncover things about your past and present that lead to a terrifying revelation. They team has plans to turn The Hum into a franchise of its own with an expansive universe, with Abustions being the prequel. The Emblematic Group, led by Nonny de la Peña, is leading the way in immersive journalistic experiences. Nonny’s previous works, Hunger and Project Syria have both garnered a lot of praise for their ability to push journalism to new heights, increasing the emotional impact of the stories being told. Nonny also believes that this new medium will help encourage younger people to watch the news, because it would be something that would speak to them generationally. Kids today “aren’t necessarily picking up the newspaper or watching broadcast TV,” so it is important to deliver news to them in a way that engages them and informs their understanding of the world around them. Vantage VR dubs itself the “Ticketmaster for VR events.” The company, founded in 2014, previously broadcasted the Austin City Limits music festival in October in VR. During the festival online attendees were able to experience the festival from multiple different angles and choose which stages they wanted to visit. The experience was broadcast in 180-degree video. Their experiences work on most of the currently available VR platforms, including the Oculus Rift, Sony’s Project Morpheus, GearVR, and Google Cardboard, and others. Their app is available on iOS and Android that allows you to view that video on your smartphone. 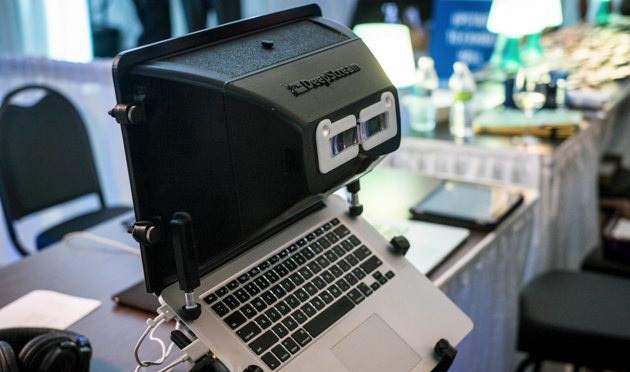 Beyond 360-degree video, the company also is working with Augmented reality and facial recognition software. The team has built experiences for the Museum of contemporary art, Lisa Maree Fashion, and Amway. Not much information is available about EmergentVR, other than they have an application that allows people to create, edit and share 360-degree VR experiences using their mobile phone. The web domain, emergentvr.com, was registered on January 9th, 2015, so I would expect more information will be available soon. My best guess is that the program will work much like the panoramic photo option on many mobile phones, where users pan and scan around their environment, and the software stitches the images together into a 360 environment. Applications for the fall program will open up “soon” says Mike Rothernburg and can be found on the River website.